After seeing the shuffle last week in the standings, there were all sorts of match-ups this week in Canada West women's hockey that could change fortunes in the first half of the season. It's becoming very apparent that within the eight Canada West teams, there are no pushovers when it comes to a weekend series and every point in the standings will earned and not given. Can Alberta remain atop the standings? Can Manitoba break out of the scoring funk they seem to be in? Can Calgary and Lethbridge get things going? Week Three of The Rundown will answer these questions! SASKATCHEWAN at LETHBRIDGE: Lethbridge needed a couple of home wins to move back among the upper teams in the conference, but they'd face a tough test in the Saskatchewan Huskies. The Huskies came in having won both games in Calgary the week before, so the Pronghorns had to come out ready. And they did - they were the better team early on, but Saskatchewan found their legs as the period wore on. Both netminders were good as Alicia Anderson stopped all nine shots she faced while Camryn Drever, making her first Canada West start, stopped the six shots sent her way. The two goaltenders were just as stingy when it came to goals in the second period. Saskatchewan carried the play until running into some penalty trouble, but the Huskies penalty-killing units remained perfect through 15 power-plays thus far this season as the teams remained tied 0-0 through 40 minutes. With Anderson having been the busier of the two goalies, she looked like she was in mid-season form in the third period. After stopping 15 shots in the middle frame, Anderson followed up that effort with another 14 stops in the third period. Drever, not to outdone by the veteran Lethbridge goalie, made ten stops of her own in the third period, but neither the Huskies nor the Pronghorns could solve the goalies through regulation time. Overtime, however, would be short and sweet for one team. After the Pronghorns broke into the Huskies zone to start the overtime period, Leah Bohlken forced a turnover and went the other way with Abby Shirley on a two-on-one. Bohlken made a gorgeous pass along the ice to Shirley who made no mistake in wiring a shot past Anderson just 14 seconds into extra time as Saskatchewan takes the 1-0 overtime win! Drever earns her first Canada West win and Canada West shutout with her 22-save performance while Anderson deserved a better fate after stopping 38 shots for the Pronghorns. Again, kudos to Saskatchewan on their player GIFs. SASKATCHEWAN at LETHBRIDGE: After the performances by the two netminders the night before, this game featured the two de facto starters for both teams as Jessica Vance and Alicia Anderson went to their respective creases. In other words, this game may be another low-scoring event with how these two defend the twine. Anderson was spectacular in the early going as she stoned the Huskies once again including a clear-cut breakaway by Emily Upgang. However, the Huskies' persistence would be rewarded eventually, even if the goal wasn't the prettiest. With a referee's arm in the air after a Lethbridge player committed a foul, Chelsea Debusschere's centering pass from the half-boards deflected up and over the shoulder of Anderson to give the Huskies a 1-0 lead at 16:17! That advantage would hold true through to the intermission, and the Huskies held the edge in shots at 14-9. The second period opened just as the first did with Saskatchewan pressing, but it would be the Pronghorns who tallied first. Ashley McCabe made a great play at the blue line to poke a puck away from a Saskatchewan player, and she would turn on the jets. As she was being checked in the Saskatchewan zone, she slid the puck across the ice to rookie Kenzie Lausberg, and the first-year player made no mistake in burying it behind Vance to tie the game at 1-1 at the 4:27 mark! Nearly six minutes later after controlling the play once more, the Huskies found the back of the net again. The initial shot by Shyan Elias was stopped, but Anderson couldn't smother the rebound before Bailee Bourassa whacked home the loose puck to put the Huskies up 2-1 at 10:19. The Pronghorns wouldn't sit back as the period continued, and they nearly tied it off a shot that beat Vance but could not beat the red iron. The score would hold to the end of the period, and Saskatchewan took a 30-23 advantage in shots and a 2-1 lead into the intermission. The third period looked like trademark Saskatchewan hockey as they came out and locked down their zone. Shots came at a premium for the Pronghorns, and the ones that did get through were easily handled by Vance. Even with the extra attacker for 1:14, the Pronghorns couldn't generate any dangerous chances as the clock expired on this game with Saskatchewan picking up the 2-1 win. Vance was solid in stopping 27 shots for her third win of the season while Anderson dropped her fourth game despite making 38 saves. Again, Saskatchewan's GIFs are the best GIFs. MOUNT ROYAL at ALBERTA: Alberta, who came into this game having shutout Manitoba twice, was looking to continue their winning ways against the Cougars. Mount Royal needed to end their two-game losing streak, but tonight's game simply went south in a hurry for the Calgary-based squad. Alex Poznikoff at 3:20, Regan Wright at 8:54, and Autumn MacDougall on the power-play at 19:49 put the Pandas up 3-0 through the opening period where Alberta outshot 13-5 as their dominance on home ice continued. Zoe De Beauville would take a seat on the bench to start the second period as Emily Severson took over for Mount Royal to try and stop the bleeding, but she would fare no better. Kennedy Ganser made it 4-0 for the Pandas at 10:06 of the second period while Alex Poznikoff scored on the power-play just 16 seconds into the third before Abby Benning added another goal 24 seconds later to make it 6-0 for Alberta. Amy Boucher would score with 1:01 to play as this game was all Alberta in a 7-0 trouncing of Mount Royal. Kirsten Chamberlin stopped the nine shots she faced for her second win and first shutout of the season while Zoe De Beauville took the loss after stopping ten of 13 first-period shots. For the record, Emily Severson made 15 stops on 19 shots in her 40 minutes of work. All the highlights of this game can be found here. ALBERTA at MOUNT ROYAL: After the hammering that the Pandas laid on the Cougars the night before, you had to wonder if Mount Royal would find the resiliency to come out and change their fortunes on Saturday. There would be no time to lick their wounds as the second-half of the weekend series went less than 24 hours later and moved down the highway to Flames Community Arena where Mount Royal would have home-ice advantage. The Pandas did what they do well in getting out and putting pressure on their opposition, but goaltender Zoe De Beauville was on her game as she weathered the early storm. The Cougars would give their netminder some breathing room when Alberta goalie Halle Oswald kicked out an Anna Purschke shot, but the rebound went to Camryn Amundson who made no mistake with the puck in putting it behind Oswald at 6:21 for the 1-0 Cougars lead! 1:28 later, that slim lead became a two-goal lead when Kate Scidmore scored off a rebound kicked out by Oswald, and Mount Royal held the 2-0 advantage! Alberta, knowing they needed to up their game, came roaring back with pressure, and Kelsey Tangjerd's shot found its way past De Beauville at 11:04 to close the gap for Pandas to one goal. Despite the growing momentum following the Alberta goal, we'd get no others in the opening frame as Mount Royal held the 9-6 advantage in shots and the 2-1 edge on the scoreboard! The second period was played fairly evenly as both sides had shots, but both Oswald and De Beauville were equal to the task. Despite Alberta outshooting Mount Royal 9-8 in the period, we'd go to the third period with the 2-1 score holding firm. The third period saw both teams loosening the defence as they pressed for goals. Alberta had chances. Mount Royal had chances. Both teams pressed. However, it would be a Tianna Ko clap-bomb that would be the only goal recorded when she blasted one past Oswald at 10:40 to put the Cougars up 3-1. Being that I just stated no other goals were scored outside of Ko's goal, you can safely guess that this game finished 3-1 in favour of the Cougars! De Beauville bounced back for her second win of the season in making 18 stops while Oswald suffered her first Canada West loss despite making 18 saves as well. MANITOBA at REGINA: The Bisons came into Regina having been shutout in two-straight games. Needless to say, they also came into Regina with the Cougars sporting a hot goaltender in Jane Kish and a two-game win streak. Could the Bisons rediscover their scoring ways? Could Regina hand the Bisons a third-straight loss? Regina was certainly the better team in the opening period despite the shots being almost even. Regina appeared to have their legs under them early, and it paid off midway through the period when Emma Waldenberger's shot was kicked aside by Manitoba goaltender Lauren Taraschuk, but Tamara McVannel jumped off the blue line into the high slot area where she ripped home the rebound to put the Cougars up 1-0 at 11:51! Regina outshot Manitoba 15-14 in the period and held the 1-0 lead through twenty minutes. The second period started with goal before the layer of water had even frozen! Off a Manitoba rush into the zone, Erica Rieder centered a pass from behind the net that deflected off a player out front and past Kish to put Manitoba on the board just 12 seconds into the middle frame to make it 1-1! Manitoba seemed to be figuring out this offence thing as the period progressed, but it would be Regina would led the period in shots once again as they held an 8-6 advantage. There would be just the one goal scored, though, as Manitoba and Regina went to the second intermission tied 1-1. The third period? It was all about the goals! Madison Cole capitalized on a turnover in the slot as she picked the corner to beat Kish at 2:54 to put Manitoba up 2-1! The two teams would go back and forth as Regina pressed for an equalizer, but it would be Manitoba who would open up a two-goal lead when Natasha Kostenko deflected an Alexandra Anderson shot past Kish at 14:29 to make it 3-1 for the Bisons! That lead would be cut to one goal 56 seconds later as Adela Juzkova followed her own backhander, grabbing the rebound issued by Taraschuk, and beating the netminder to make it 3-2! Kish would be summoned to the net with over three minutes to play as the Cougars pressed for the equalizer, but it would be Manitoba's Karissa Kirkup who found the abandoned Regina net with her shot at 19:02 to propel the Bisons to the 4-2 victory! Taraschuk stopped 30 shots as she picked up her third win of the season while Kish stopped 30 shots of her own in the loss. MANITOBA at REGINA: The two teams entered Saturday's contest with similar 3-2-0-0 records, so something had to give. The only question was which team would grab the advantage? The Bisons would hit the scoreboard first as Natasha Kostenko centered a puck that found the stick of Sheridan Oswald, and the Bisons' sniper went five-hole on Morgan Baker at 3:48 to put Manitoba out in front 1-0. Regina would respond just past the midway point of the period when Jaycee Magwood sent Jordan Kulbida in alone on a breakaway, and she would fire a shot over Lauren Taraschuk's glove at 12:54 to even the game at 1-1! Regina held a 12-8 lead in shots at the intermission, but the teams were deadlocked at 1-1. The second period opened with both teams playing a little more defensively-minded. The Cougars would grab the lead at 6:52 when Jaycee Magwood's rather innocent-looking shot somehow found its way between Taraschuk's pads and slid slowly across the goal line for the 2-1 Regina lead. Late in the period, Manitoba squared the game up when Lauryn Keen took up residence at the top of Baker's crease and deflected a Taryn Kokesch shot past the Regina netminder at 18:47 to make it a 2-2 contest through 40 minutes! The third period started with Erica Rieder being sent off for a trip, giving Regina the opportunity they needed to take the lead. Emma Waldenberger took a pass from Emily Middagh, broke into the Manitoba zone on the left side, and wired a wrist shot high to the right corner of the net past Taraschuk at 1:43 for the power-play and, more importantly, the 3-2 lead! This goal seemed to light a fire under the Bisons, one Bisons player in particular. Wowzers! Karissa Kirkup began this play by circling in front of her own net before heading up ice on the right side. She chipped the puck past Waldenberger, but it went a little too far for her to collect. She continued the forecheck, and forced turnover at the Regina blue line. Upon collecting the puck with speed, she went to the backhand high over Baker's glove to complete an incredible individual effort on a highlight-reel goal as Kirkup's unassisted marker at 6:55 brought the Bisons back to even at 3-3! Despite the early goals, both team traded chances before the horn sounded. With the game knotted up at 3-3, we were off to overtime! The four-on-four overtime saw Manitoba outshoot Regina 4-1, but we'd see no goals. The three-on-three overtime was nearly decided when Alison Sexton got a step on a defender, took a pass from Kirkup, and went to the backhand, but her shot miss the post after Baker bit hard on the deke. With no goals in the second overtime period, we'd need a skills competition to settle this game! Jordyn Zacharias and Jaycee Magwood would trade goals in Round One. Round Two saw Courtlyn Oswald and Emma Waldenburger both find the back of the net. This left Karissa Kirkup and Emily Middagh to try and settle this game. Kirkup's goal combined with Taraschuk's save gave Manitoba the 3-2 advantage in the shootout and the 4-3 shootout victory! Taraschuk stopped 28 shots plus another in the shootout to give her the win while Baker took the loss while stopping 27 shots but went 0-for-3 in the shootout. CALGARY at UBC: There's no doubt that Calgary has struggled thus far, picking up just one point of a possible 12 points total. UBC, meanwhile, has built a 3-1-0-0 record and was looking to continue their winning ways. Remember how I mentioned how things went south in a hurry for the Calgary-based Cougars? Well, the same thing could be said for the Calgary-based Dinos. Ireland Perrott opened the scoring at the 6:36 mark of the first period, and Ashley McFadden added a power-play marker with one minute to play in the first period as UBC jumped out to the 2-0 lead. There would be no goals recorded in the second period, but the third period saw a pair of empty-net goals with Calgary's Kelsey Roberts on the bench. Celine Tardif hit the yawning cage at 17:08 and Mathea Fischer potted her own empty-netter at 18:50 to wrap up the 4-0 UBC victory. Amelia Boughn stopped all 20 shots she faced for her second win and first clean sheet of the season while Kelsey Roberts stopped 36 shots in the loss. CALGARY at UBC: After being beaten at virtually every facet of the game one night earlier, Calgary really needed to find another gear if they hoped to earn a victory over UBC this weekend. UBC, on the other hand, was looking for a second-straight weekend sweep, and they pretty much put on a repeat performance of what they did the night before. UBC played fairly conservatively in the opening of this game, but they would use their speed to open the scoring. Logan Boyd and Rylind MacKinnon broke in on the two-on-one, and Boyd's decision to keep and shoot was a good one as she fired the puck past Calgary's Kira Wasylak at 7:08 to make it 1-0 for the T-Birds. Calgary amassed most of their shots on a couple of late power-plays, but the UBC penalty-killing units were equal to the task as the Thunderbirds took the 1-0 lead into the intermission. Calgary's Merissa Dawson would be called early in the second period for using the body a little too aggressively, and that sent UBC to the power-play just 53 seconds into the stanza. That's the break UBC needed to double their lead. Rylind MacKinnon's blast from the point found the back of the net at 1:39 for the power-play goal, and the T-Birds held the 2-0 lead. Calgary would respond by using speed to dictate the pace, but UBC adapted and would prevent the Dinos from ruining Tory Micklash's evening. After two periods, UBC led 2-0 thanks in part to an 18-8 edge in shots. In the third period, UBC continue to overpower the Dinos, and their persistence in going to the net would pay off with another goal. Hannah Clayton-Carroll took the great centering pass from Mathea Fischer, and she ripped home the third UBC goal of the night at 10:35. 56 seconds later, Emily Costales netted another goal for UBC, and it was a 4-0 lead for the home squad. The seven shots recorded by Calgary resulted in no goals for them as Tory Micklash was solid on this night, and UBC claimed a fifth-straight win with the 4-0 decision. Micklash recorded her third win and second shutout of the season in stopping all 15 Calgary shots while Wasyluk made 28 stops in the loss. 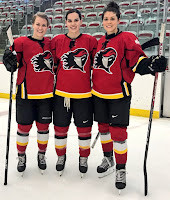 Ladies and gentlemen, these are the three stars from the Calgary Inferno-Kunlun Red Star game today. Notice that woman on the left? That would be the first star of the game and former Manitoba Bisons star Venla Hovi! Hovi recorded a goal and an assist today in the game against KRS, and her goal actually was scored on a deflection in front of Finnish national teammate Noora Raty! Hovi's assist came on the goal scored by the woman standing in the middle. That's Manitoba native Halli Krzyzaniak who scored her first goal today in being named as the second star of the game! 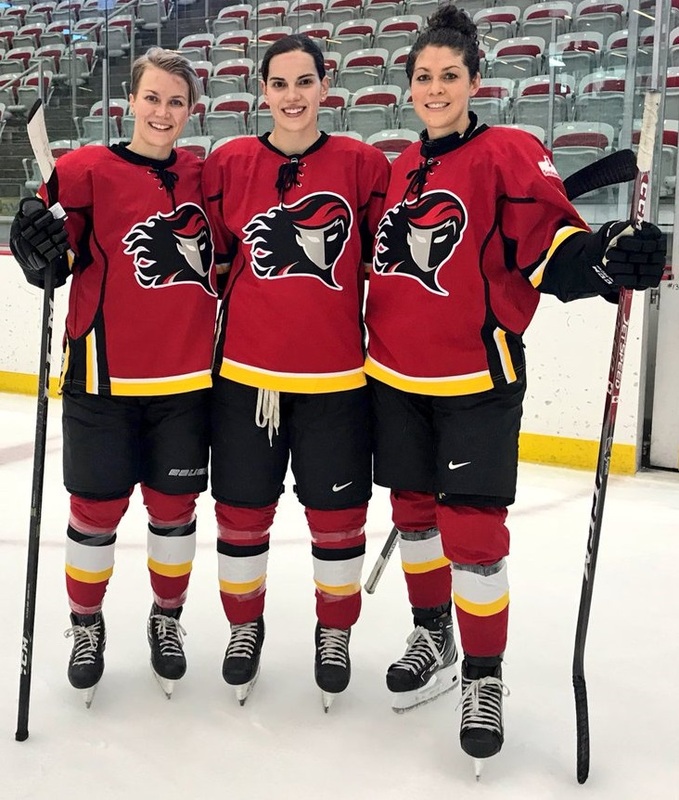 Hovi appears to be settling in nicely alongside the plethora of Canada West players who are part of the Inferno roster, and it's nice to see she's doing well at the professional level! Way to go, Venla, and keep up the great play!